Yesterday, Bloomberg Businessweek published an article entitled “Coke thinks designer milk could be a billion-dollar brand.” Coke is part owner of fairlife LLC, makers of the namesake ultra-filtered high-protein milk. As mentioned in the article, and something I have heard fairlife co-founder Mike McCloskey say time after time, “Milk is one of nature’s superfoods.” Thank you, Mike. You can read the article HERE. The numbers speak for themselves. Specialty milk sales jumped 21% in 2015, up from 9% in 2014, according to Bloomberg research. This increase is directly correlated to Coke’s investment in Fairlife milk. To read “Fairlife: The story behind the innovation,” link HERE to an article I wrote for Food Business News. Like I said, the numbers speak for themselves. Let’s talk Natural Products Expo West, which took place March 10 to 13 in Anaheim, CA. I was so glad to learn a couple of days ago that it was not just me thinking the exposition was insanely crowded (borderline dangerous). It truly was jam packed. It was reported that the 36th edition of this annual event experienced another record-setting year with 6.9% growth. The Anaheim convention center hosted more than 77,000 attendees. The event brought together an inspired community of industry members and more than 3,000 exhibiting companies, including more than 600 first-time exhibitors. These total numbers, along with the growing number of exhibiting dairy processors, confirms the unstoppable growth of the natural products industry. Just 10 years ago, this group was all about granola and vegan diets. This year, all-natural, organic, clean-label animal-derived products (mainly dairy and jerky) were very prominent, and without protest. New Hope Network, the expo organizers, project strong growth for the natural products industry. U.S. consumer sales of natural, organic and healthy products are expected to grow 64% from $153 billion in 2013 to $252 billion by 2019, including growth of 9% per year driven in part by new and emerging brands. I believe many of these will be dairy or based on dairy. That’s because milk is one of nature’s superfoods. Also this week, it was reported that Gatorade, a brand of PepsiCo, Coke’s leading soft drink rival, is embracing the superiority of dairy, too. The brand is said to be working on a new line of products including a night protein yogurt to boost workout performance. 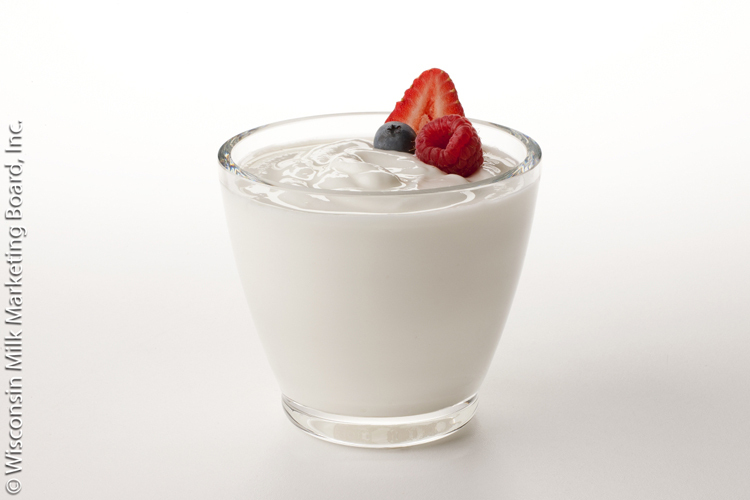 The yogurt concept is all about addressing overnight muscle repair. It focuses on the casein protein content. The human body digests casein much slower than whey proteins, making it ideal for rebuilding muscle while consumers sleep. A study from The Netherlands found consuming casein after a workout and a half hour before bedtime led to greater muscle protein synthesis. In a separate study published in the Journal of Nutrition in August 2012, researchers found ingesting protein before going to sleep led to a greater increase in muscle mass and strength compared to participants who took a placebo before bed. The MilkPEP folks are making an even greater effort this month—National Nutrition Month—to educate consumers about the nutrient density of milk. 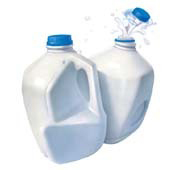 Did you know milk is one of the most nutrient-rich beverages you can find? In fact, there are thousands of studies that have documented the benefits of drinking milk, which is why nutrition experts recommend adults drink three servings of milk or milk products a day. Yet, most Americans fall short of the USDA’s recommended daily servings. No matter your age, it’s hard to get the nutrients you need without dairy in the diet. Milk is the top food source for three out of four nutrients of concern, which are nutrients many Americans are lacking. These are calcium, vitamin D and potassium. The fourth nutrient of concern is fiber. And, guess what? Dairy foods are an ideal carrier of added fiber food ingredients. All milk, regardless of fat content, the cows’ diet or the cows’ pasture regime, contains nine essential nutrients. This includes B vitamins for energy, vitamin A for a healthy immune system plus several bone-building nutrients. Milk is also a source of high-quality protein. This means the protein is complete, as it contains all the essential amino acids in the proportion the body requires for proper functioning. 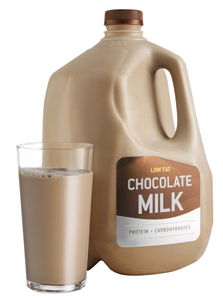 A simple rule of thumb to communicate to consumers: every ounce of fluid milk provides a gram of protein. Dairy marketers must never stop communicating the fact that it’s hard to get all of the nutrients the body needs without real dairy milk and dairy products in the diet. Milk resonates with today’s consumers as it is simple, wholesome, real and more often than not, local. Milk is one of the original farm-to-table foods. Did you know 97% of dairy farms are still family-owned and operated? At Expo West, dairy foods manufacturers showcased how milk can be further enhanced with nutrients to create real powerhouse products. Here are some of those concepts. Dairy Innovations showcased its new Fruzinga line of high-fiber, probiotic drinkable yogurts. Made with real fruit and no added sugar, the naturally gluten-free beverage is made with a skim milk yogurt base enhanced with milk protein concentrate to deliver 7 grams of protein in every 7-ounce bottle. This is in addition to 8 grams of prebiotic fiber to support digestive health. Together, the protein and fiber help satiate the consumer, assisting with weight-loss and weight-management programs. To read more about Fruzinga, link HERE. Figo Brands offers Forte Gelato now made with Fair Trade ingredients. 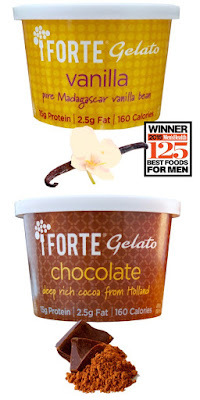 Forte Vanilla Gelato with organic Fair Trade Madagascar bourbon vanilla was awarded Men’s Health Best Ice Cream in November 2015. Forte Chocolate Gelato is now made with organic Fair Trade cocoa from Holland. All of the gelatos, which also include Espresso and Ginger varieties, are now sweetened with organic Fair Trade cane sugar and organic agave nectar and stabilized with only cage-free egg yolks. Flavors are sourced from their origin, not from added natural or artificial flavorings, according to Adrian Pace, founder and CEO. 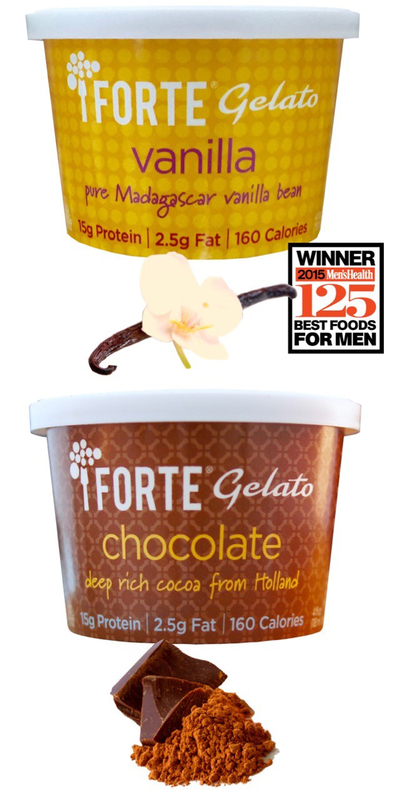 All Forte Gelato offerings contain 15 grams of protein per 4-ounce single-serve container. This is accomplished through the use of skim milk and added milk proteins. A serving also contains 2.5 grams of fat and a mere 160 calories. For more information, link HERE. Interested in learning more about on-trend dairy products such as these two concepts? Plan on attending the International Dairy Foods Association’s annual Ice Cream Technology conference April 12 to 13 in Florida and the Milk and Cultured Dairy Products conference May 24 to 25 in Indianapolis. For more information, use the links below. I will be speaking at both conferences on industry trends driving innovation. In the next few weeks, I will showcase other dairy ingredient-enhanced dairy foods including frozen desserts, cultured dairy snacks and even cheese spreads. Expect to see more innovations containing highly functional and nutritional isolated milk components. For example, select milk protein hydrolysates contain bioactives with relaxing properties, which have been clinically proven to reduce stress-related symptoms such as mood swings, sleep disorders, food cravings, tension, digestive disorders, and impaired memory and concentration. Lactoferrin is a naturally occurring protein found in milk. With its high iron-binding capacity, the protein has strong anti-microbial activity and supports immunity while also encouraging good gut health. Casein is available as an ingredient. In particular, micellar casein is 92% casein and 8% soluble whey protein. It has application in products designed to deliver slowly digested protein for muscle recovery and weight loss. 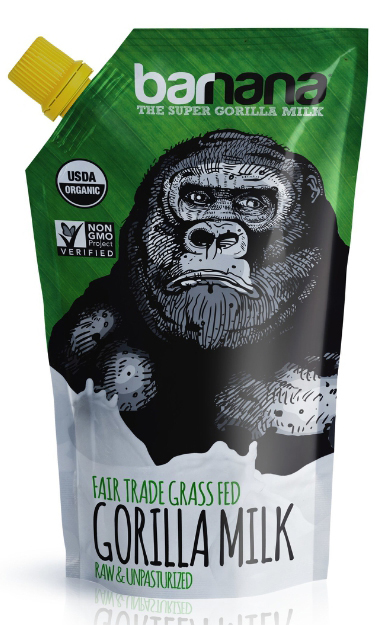 By the way, if you were wondering about the Gorilla Milk I spotlighted a few weeks ago, here’s the scoop. According to the company Barnana, just because you can milk a gorilla, doesn’t mean you should! Barnana launched the Gorilla Milk campaign to raise awareness to bettering the environment, people, and the animals that we cohabitate the planet with. It’s a jungle out there!